Pete Giordano has spent a lot of time in Oregon's Coast range, poking around in the woods, looking for stuff to paddle. He has found some pretty good runs over the years, but each new run has involved a lot of driving and many long hours puzzling out the maze of logging roads that criss-cross the mountains. 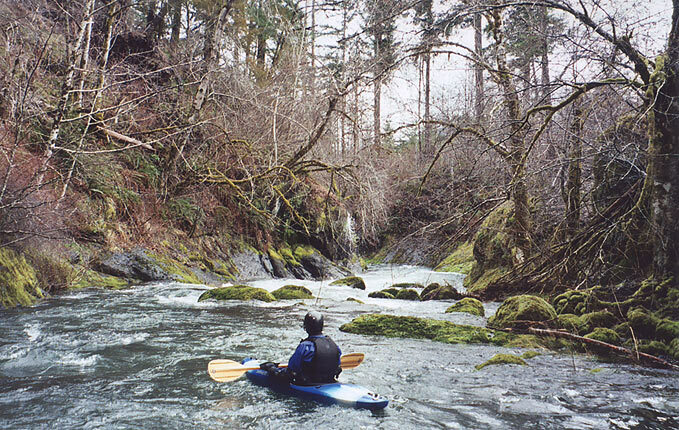 That said, his efforts are much appreciated by those in our paddling circle, especially when he finds new creeks to run! Pete's latest discovery was Upper Rickreall, a playful little creek that empties into a reservoir high in the mountains west of Salem. In the end we all agreed that though Rickreall Creek wasn't very hard, it was nice to find such a clean (i.e. very little wood) little stream out in the middle of nowhere. On this particular day Pete and I were joined by Gabe Flock out of Eugene, a paddler with a very long resume of exploratory runs in the northwest. 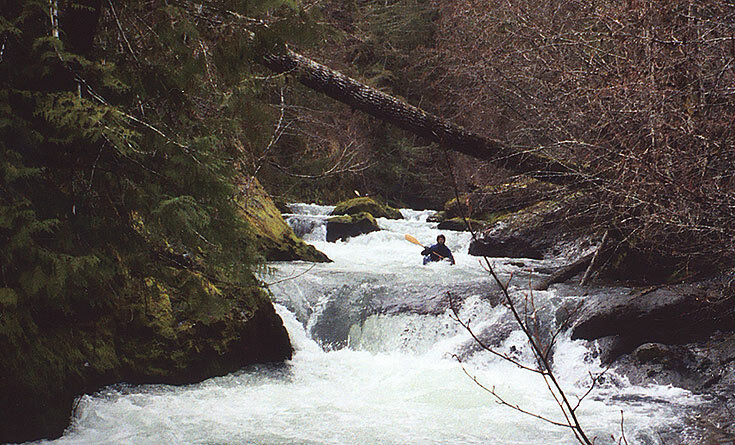 Like Pete and I, Gabe loves to paddle new creeks, so it wasn't too hard to trick him into coming along on Rickreall.. The road runs alongside the creek all the way up, allowing paddlers brief glimpses from forty feet overhead. One of the most intriguing things about this creek, though, is how remote it feels in spite of the road. Most of the creek is down in a cool little gorge, and you wouldn't even know the road was there if you hadn't just driven it to get to the put-in. Pretty much the entire creekbed on this run consists of bedrock, which forms some really cool class II-III rapids all along this two-mile section. At high water Upper Rickreall would be an excellent play run, with lots of surfing and some nice stiff holes waiting to pound the bejesus out of you in the final crux gorge. 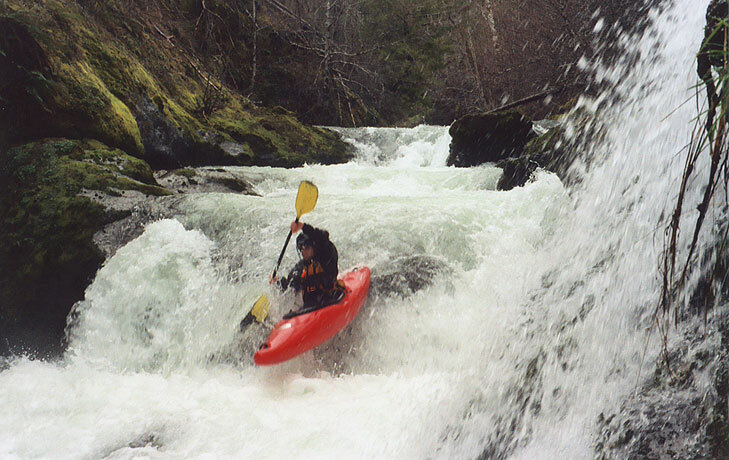 Speaking which, the biggest challenge facing paddlers on this creek is Rickreall Gorge, a very short pitch of whitewater at the end of the run consisting of six successively larger ledge-drops. The final two drops in the gorge cannot be scouted or portaged from creek-level, so be sure you scout them ahead of time for wood! Drop number five and six in the crux gorge cannot be scouted or portaged from creek-level, so they must be scouted ahead of time. This can be done pretty easily from the road, assuming you know where to look. 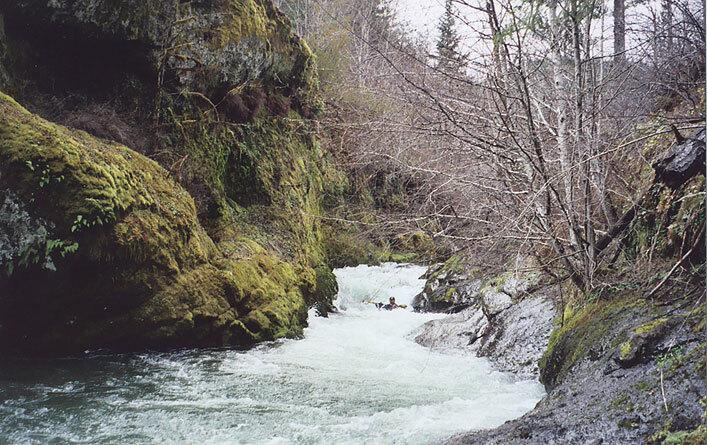 (The gorge is about .5 miles upstream from the take-out, and is hidden from the road by about 50 feet of thick brush and small trees). The author runs number five in the crux gorge. Note the boulder in the landing zone (ledge number four is shown in the background). Gabe below Rickreall Gorge. Most of the rapids on the creek are like this, small but interesting. Hoo boy, access on this one's a doozy, which is unfortunate because I think lots of intermediate paddlers would really enjoy this one if it were easier to get to. Dig out your map and locate Rickreall Creek, then find the reservoir halfway up; the take-out on a little side-road just upstream from where Rickreall becomes the reservoir at a tiny low-head dam. Drive upstream from the put-in until you reach the third yellow bridge, which is actually the North Fork of Rickreall Creek. Just downstream from the put-in the South Fork joins in, doubling the flow. FYI: Most of the roads in this area are off-limits or gated, but there is a way in if you are determined and willing to drive around a lot.. Flows: We did Upper Rickreall when the Little Luckiamute was about 350 cfs and the SF Yamhill was at 1600 and dropping, as shown below.